Recent developments such as the Eurozone and refugee crises and the “Brexit” demonstrate that the EU presents genuinely political choices to the citizens of the member states, often with far-reaching and divisive effects on their domestic politics. In this context, national parliaments have emerged as one of the few arenas of public debate and contestation about the decision-making of the EU, and hence an important source of its democratic legitimacy. 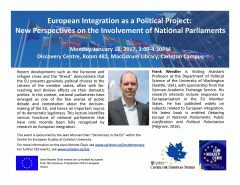 This lecture identifies various functions of national parliaments that have only recently been fully recognized by research on European integration. Frank Wendler is Visiting Assistant Professor at the Department of Political Science of the University of Washington (Seattle, USA), with sponsorship from the German Academic Exchange Service. His research interests include responses to Europeanization in the EU Member States. He has published widely on subjects related to European integration. His latest book is entitled Debating Europe in National Parliaments: Public Justification and Political Polarization (Palgrave, 2016). This event is sponsored by the Jean Monnet Chair “Democracy in the EU“ within the Centre for European Studies at Carleton University. For more information on the Jean Monnet Chair, see www.carleton.ca/jmcdemocracy.